Enjoy naturally stunning surroundings and world’s first underwater massage treatment rooms. Daybreak. Early morning light sifts through the curtains. Inside, the air is still, hushed. Subdued. Beyond the window, a sensual garden of light, sand and sea beckons; lifts you from the sensuous embrace of your king bed. Those first morning rays bathe the terrace, scattering across the surface of the lagoon. Serene waters. The lagoon shimmers, glistens. Beckons with its cooling embrace. From your private deck, panoramas of the Indian Ocean expand in all directions. 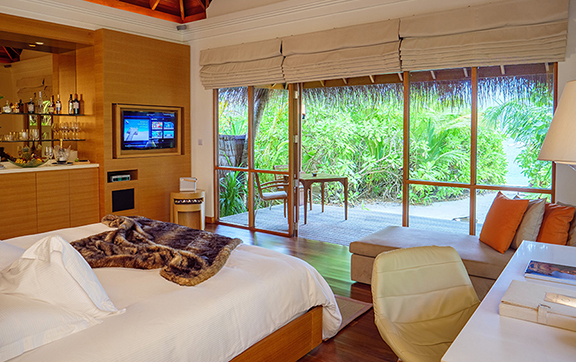 The tantalising world of Huvafen Fushi is yours to explore. But for now, you’re content to ease into your plunge pool as each seductive moment washes over you. 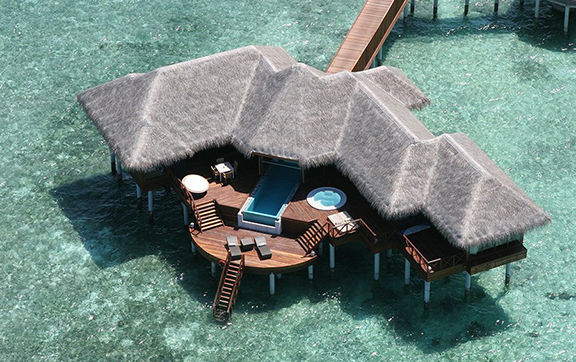 Immerse yourself in the Maldives. Cocooned in your own sensuous space. The horizon expands before your private courtyard. A vivid seascape draws your gaze from the sun lounger on your private deck. Blue skies kiss the turquoise sea. Nature merging seamlessly with iconic design. Your Deluxe Beach Bungalow capturing the sunrise. Lounging on a three-tiered deck. Limbs drawn along the lines of a sumptuous daybed. Basking. The Indian Ocean spreads in every direction. Life is a picture-perfect fantasy, every seductive detail yours to enjoy, from the cool blue of your pool to the tropical sunshine. Sprawling, two-tiered terrace. 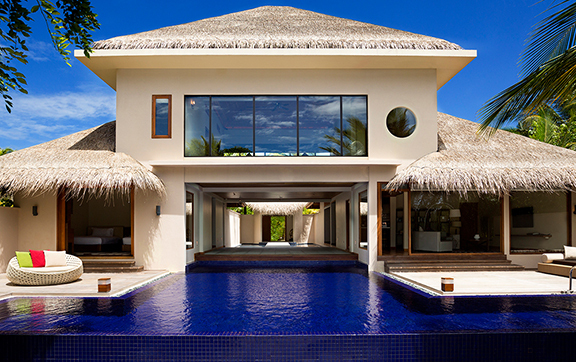 A plunge pool bridging the threshold, indoor to outdoor. Midnight Jacuzzi bathed in moonlight. Fibre-optic starlight. A breeze murmurs over the open waters. Whisks across the surface of the sea. 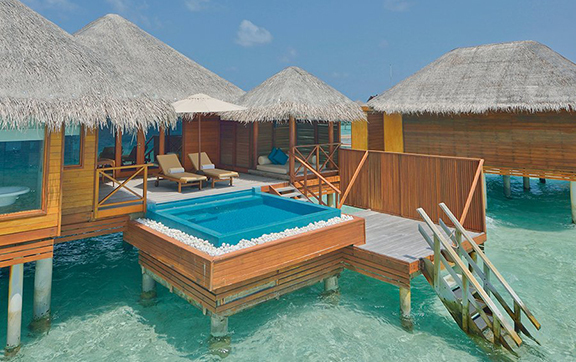 Drift into another world at Huvafen Fushi. A radiant, avant-garde estate. From an elevated master bedroom, the seascape is yours alone. One staircase descends into your garden. Another into the great expanse of the Indian Ocean. Want for nothing, live for the moment. A true Luxury Maldives Penthouse. A unique clever exemplar of vintage nostalgia meets Modern Parisian living areas, true to the enigmatic character of New York, the Upper East Side style. 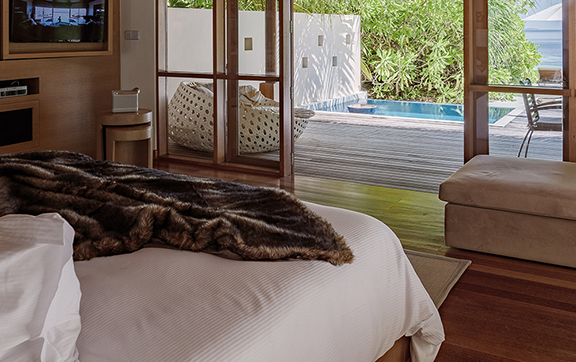 An elevated master bedroom with an open plan bedroom and playroom, featuring an oversized ocean view bath, private steam and sauna wet area and balcony overlooking the black lava stone infinity pool, which is Burgundy floodlit as the sun sets over the house reef. Endless seascapes. Infinite seduction. Surrender to the embrace of Huvafen. 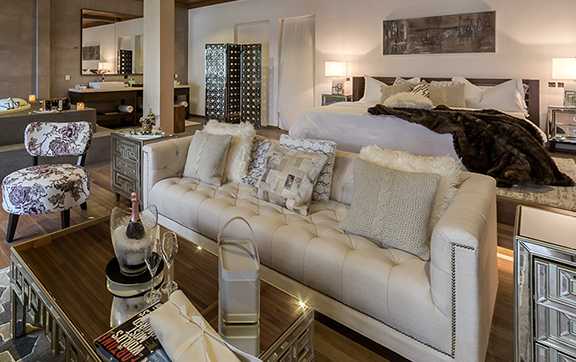 Awaken to a world of timeless luxury. A secret haven on North Malé Atoll, just 30 minutes by speedboat from the international airport. A dreamscape of hidden pleasures, where every second transcends time. A sanctuary for lovers of life. 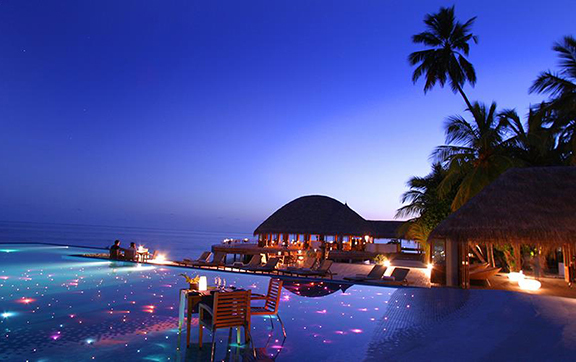 Best Maldives resort for couples.